Well, I accomplished one weave and made progress on the second downward on the first rectangle panel. 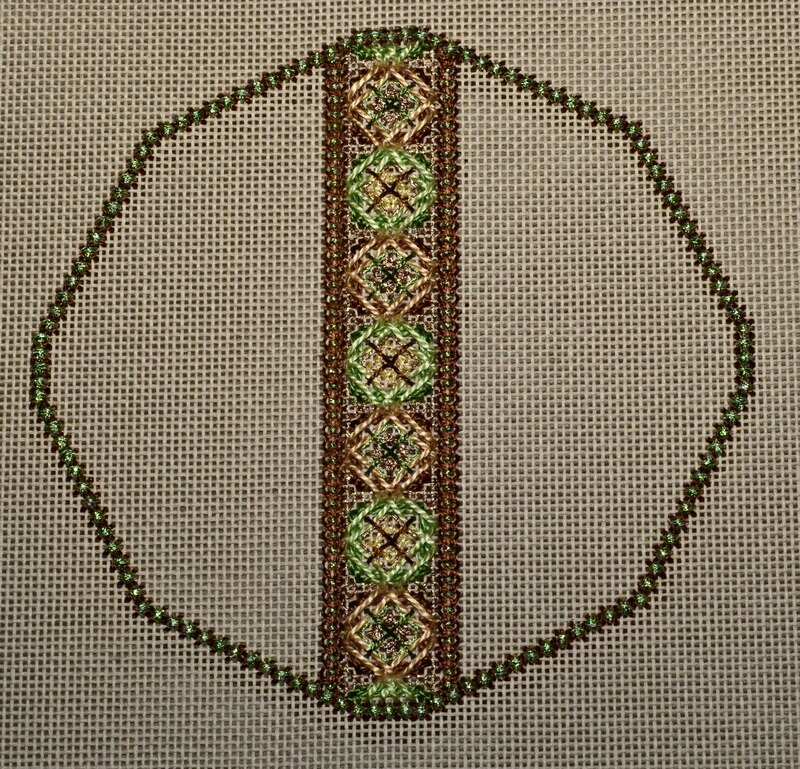 The second band got some progress, too. 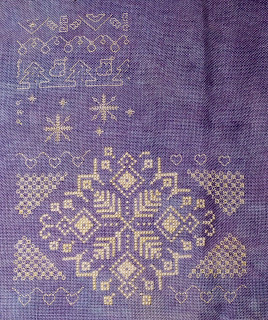 The bottom egg's getting more filled in and the line on the bottom left, with the exception of the golden thread, is done. It's progressing pretty well, although I don't think I'm going to be able to finish all four eggs before the end of the year. I finished it last week, but am just now getting around to posting the picture. Here's a complete Tiramisu! Now I have to figure out what to do with it. 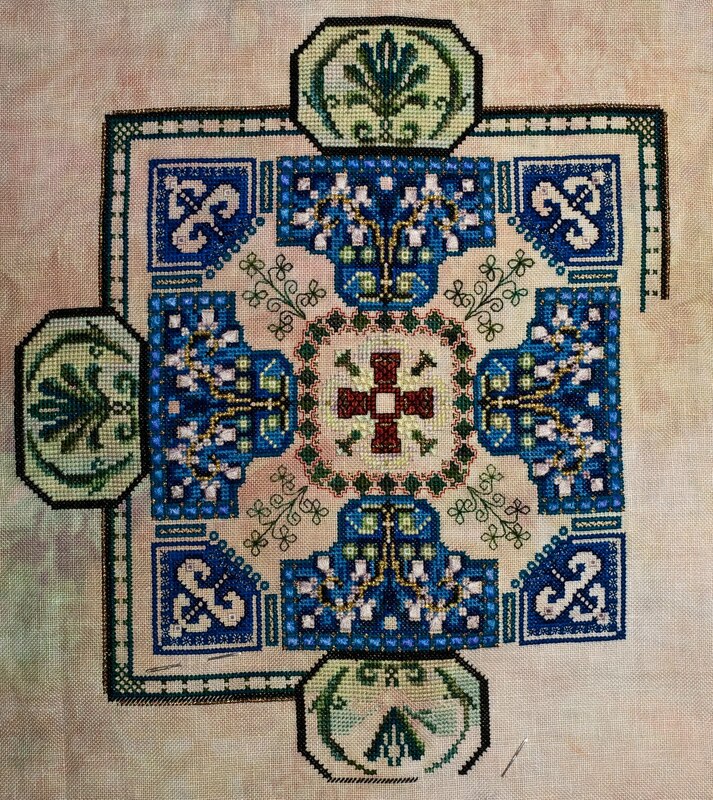 I'm thinking of finishing the edges and making it into a table runner. Anyway, a year and a half or more of work went into it and it's one big project done. 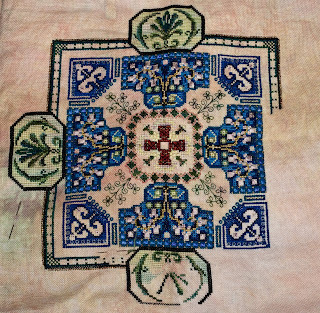 I worked on the Kaleidoscope Mandala this week, and another part is nearly done. 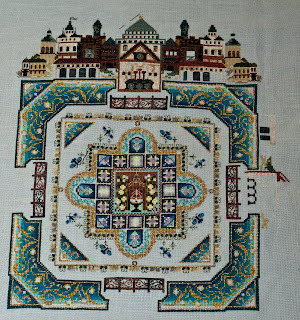 Then I'll be on to Herz Rot-Weiss to get its next part done. 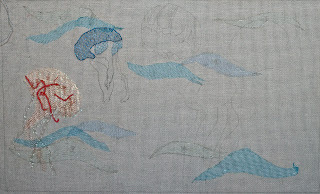 I've finished the light blue areas on the second jellyfish this week. 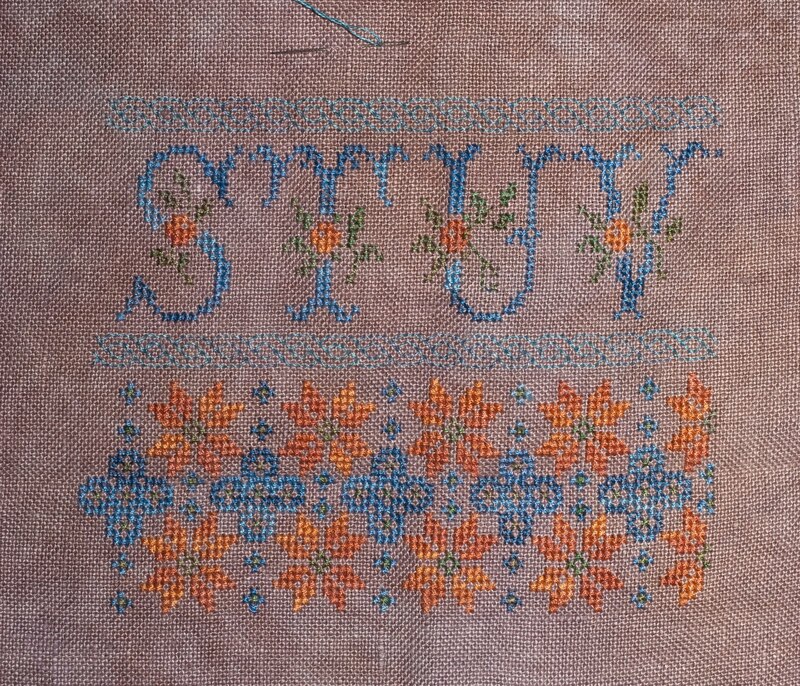 It's kind of tedious with the two different thicknesses of threads and keeping track without tangling them, but the result's pretty neat. Now on to the white. 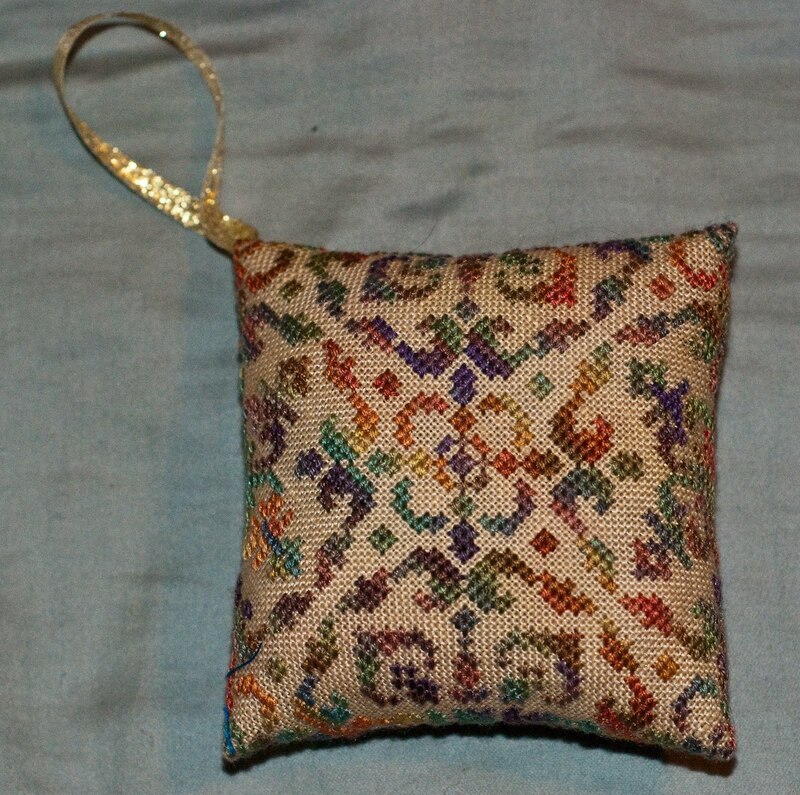 I received this ornament as part of the Friendly Stitchers exchange. Thank you Joyce! 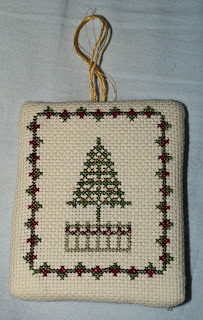 I really like it and it'll go on a doorknob for Christmas, since we won't have a tree. I finished my repairs on the STUV and completed the section. I think it looks pretty nice. 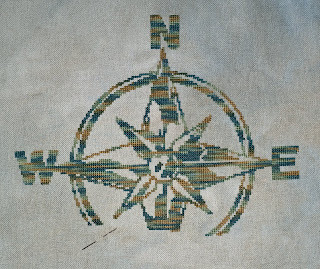 I had to redo most of the sweep down on the west side - it was off and I discovered the mistake this week. I've been doing a lot more frogging than I've been happy with lately. 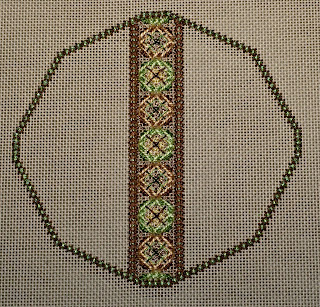 I did make progress and now it's fixed, so it'll all come together soon. I'm almost at the point on this where I just sit down and finish it. I'm back to working on the Christmas Mystery since it's got a lot of parts and I was chastized for not making more progress before Christmas on it. So, I started part four. It's coming along pretty quickly. I had a bit of a problem making these for an exchange on my crazy quilting group, but I finally finished them. My sewing machine decided it didn't like overseas travel and died, so I had to hand piece both blocks. 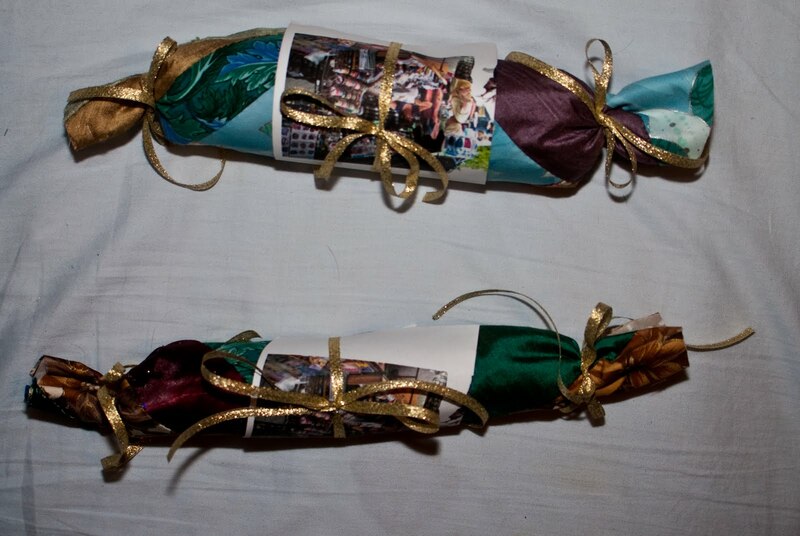 The note tied onto each block is a picture of the place where I bought some of the things here in Uruguay. 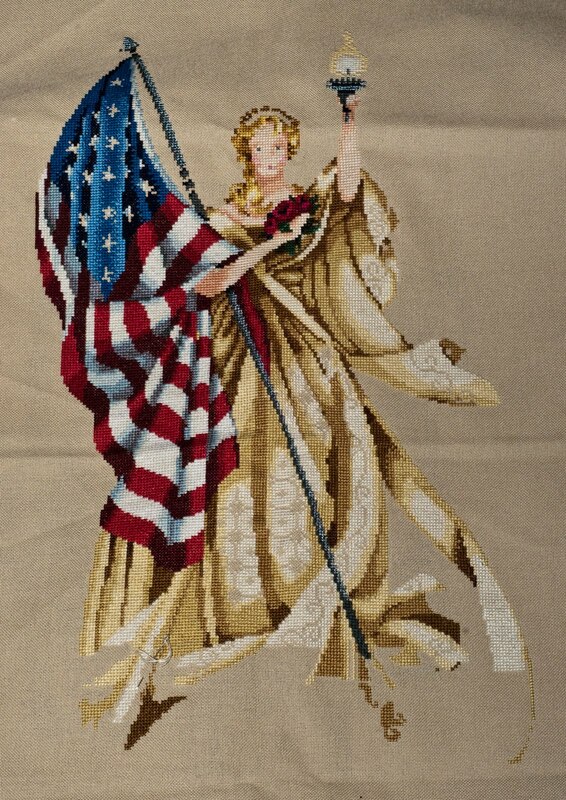 Both blocks were sent last Friday and are winging their way to the US and Canada, respectively. I hope their owners-to-be like them! I participated in the fall exchange on the BBInteractive YahooGroup this year, and sent this to my partner. She's received it, so I can post it now. 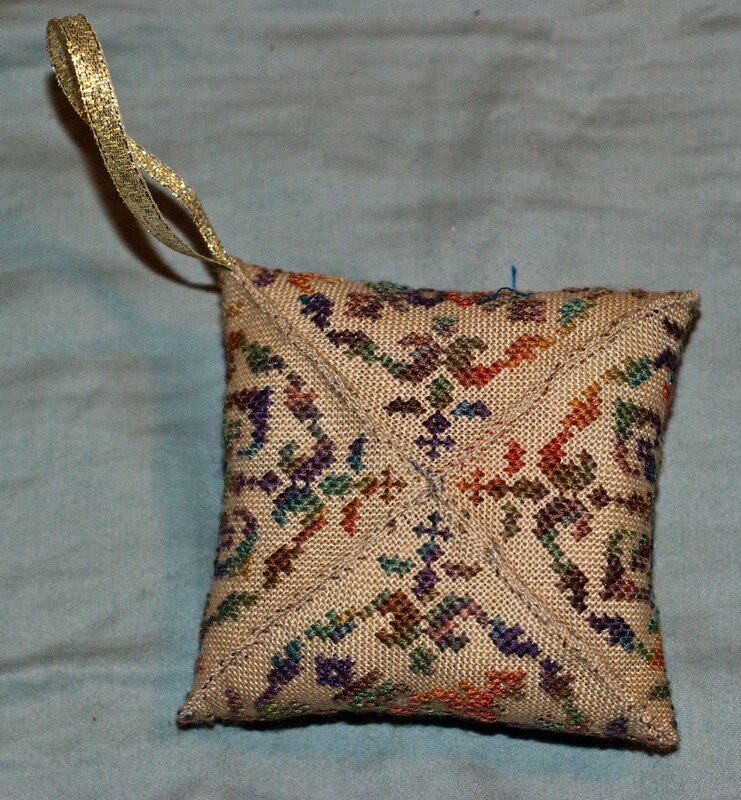 The pattern was off of a French freebie site, and I like the way the thread turned out. It looks like fall to me. 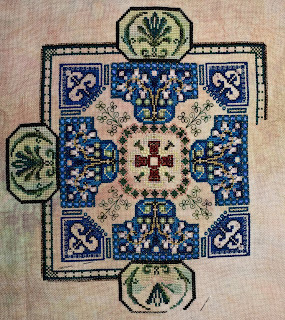 Blue's almost done on the lower left lines and the other side of the acanthus is started in the bottom egg. Some more of the background got done this week, too. For the past month, I've been using a computer that's not mine. Mine's in the Dell shop getting repaired. Luckily, it's still under warranty. So I can't rotate this picture for you as I normally would. It's Tiramisu, of course, but upside down. It's also showing that I'm on the very last band. So close to being done! Next time I work on it, it's finished. I got more done on the bookmark from HAED. 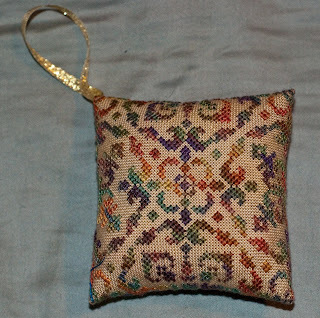 The head is about done now, and it looks different than the picture on the pattern, but then I think they always do. Pictures don't capture the details. I always thought it was a salamander, but the head's not salamander-ish. Perhaps it is a dragon, after all. I finished the middle stripe finally. 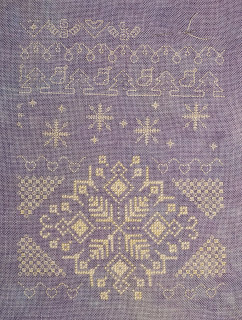 About a third of the total pages for the whole ornament were about this stripe. Now I get to go on to the other two-thirds of the instructions. I made a mistake and discovered it four letters later... which means I had to frog. This picture is mid-ribbit. The S and the first part of the T are correct. The U and V are not. Can you see the mistake? 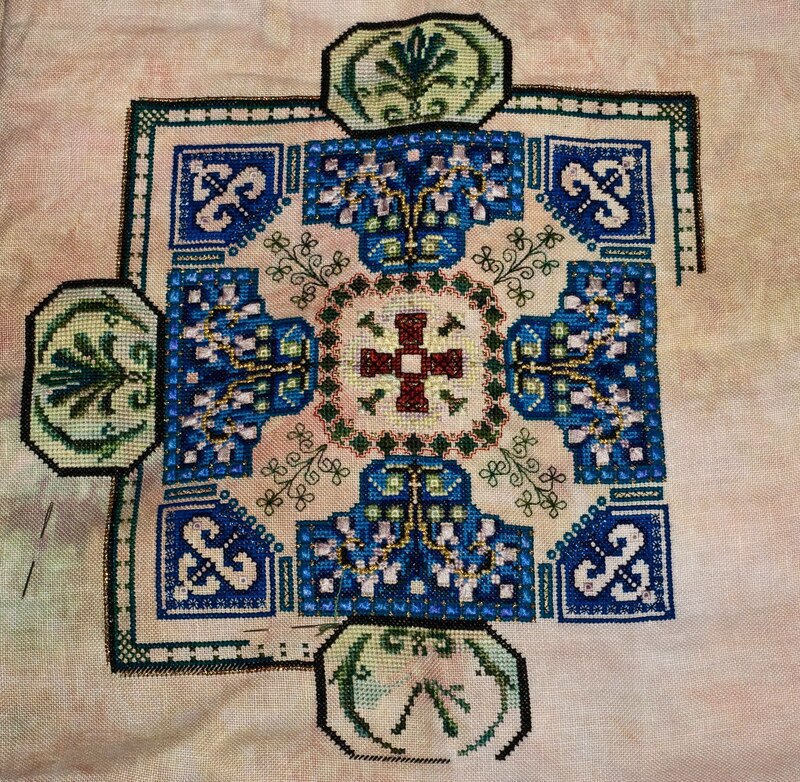 Since the picture, I've completed the part and moved on to the next stitchalong project -the Kaleidoscope Mandala. So I decided to share a couple of pictures of the neighborhood. 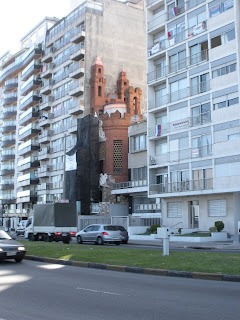 The main street, the Rambla, runs right next to the shore and has a lot of high rise apartment buildings along one side. 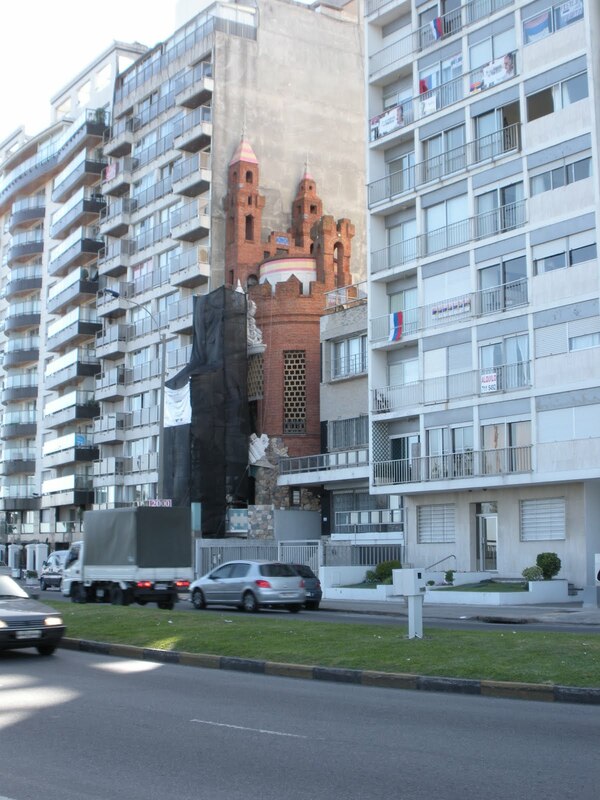 In this picture, an old church being restored is wedged between two of them. This is the other side of the Rambla - beach and shoreline for the entire distance. 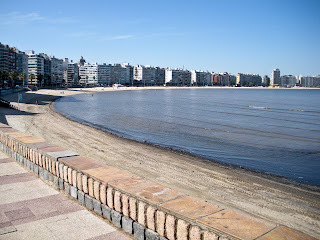 This is the beach by Positos. No sunbathers as late in the day as this picture was taken, but lots of people in the park next to it. Very nice area to walk around. I added more ribbon down the side this week and did more ecru in the middle of the skirt. Lots of light color. As of this week, I've rebuilt my rotation and have worked on all ten items in it. Now to keep up the pace! 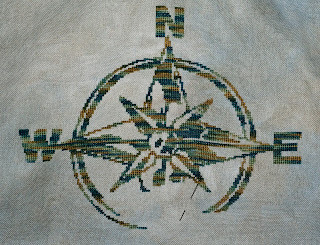 All the points but one are done on the compass. 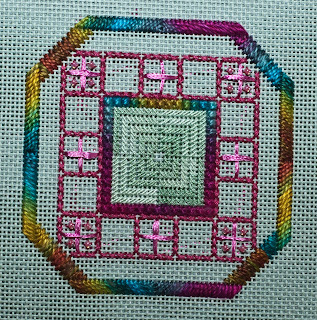 It's coming along pretty well, though after this picture I saw a mistake rather far up in the lower curve below the W. So I spent a lot of today so far repairing it. The second line's no longer, but it's more filled in after this week. 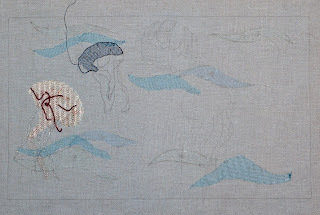 On the first panel, I've gotten all the first row of color done and am working on the second and third. 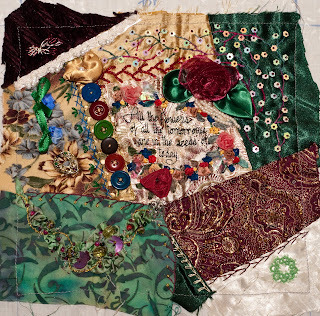 The color I've been stitching most with this week on See the Stars is the Fleckstone that blends in with the fabric. 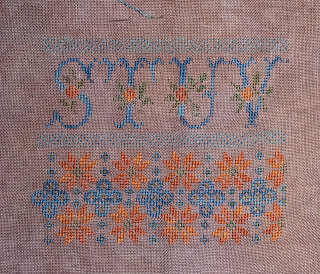 I've had to be really careful with the backstitching because it's so hard to see. 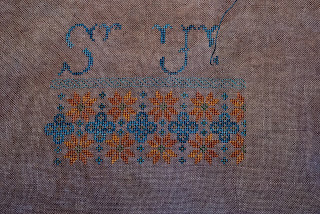 It's been a while since I've worked on this - I had to get it to Uruguay, after all. I did this week, though! 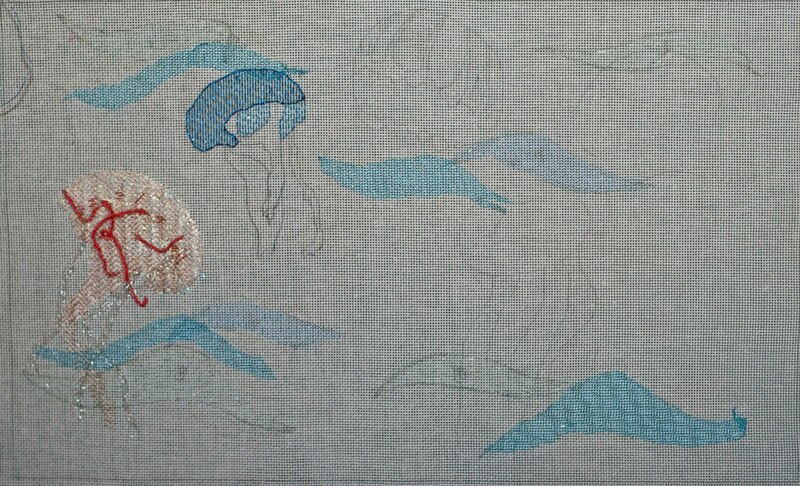 I added more to the top of the second jellyfish. That part's almost done, and it's back into my (new) rotation. Four months late, my Whatever Goes round robin was returned. 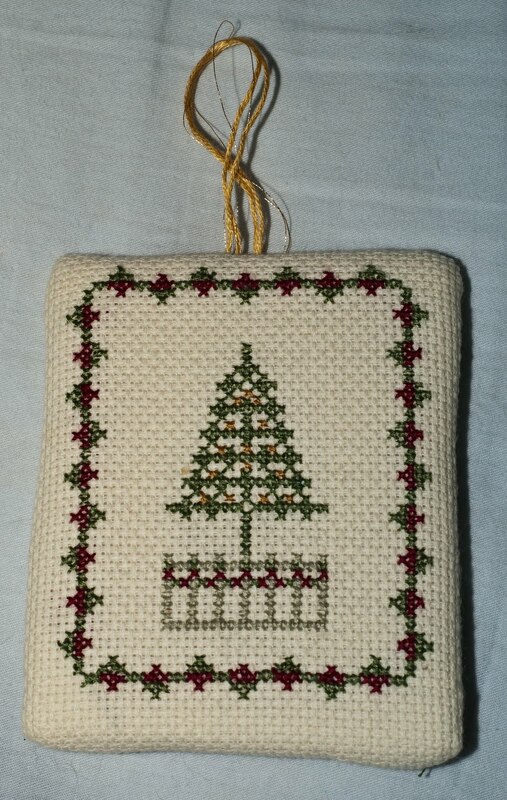 I like the way it looks, although I've never had a verse on one of my blocks before. Thank you to all the ladies who worked on it. 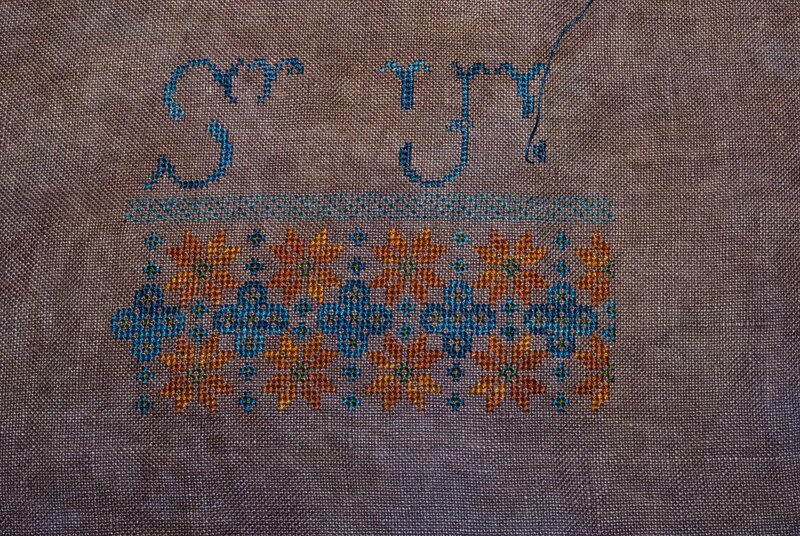 Now I need to figure out how to finish it into a larger project. I went into the local merceria in the mall this past week and decided to splurge a little bit. I bought these three ribbons. 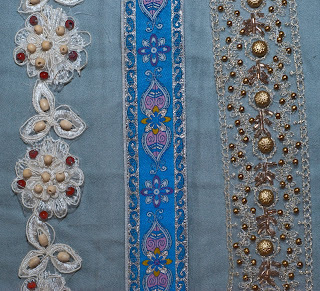 The middle one's got metallics, but the outer two have beads. The one on the left is all wooden beads. It'd be great, I thought, to cut it up for flowers on a block. 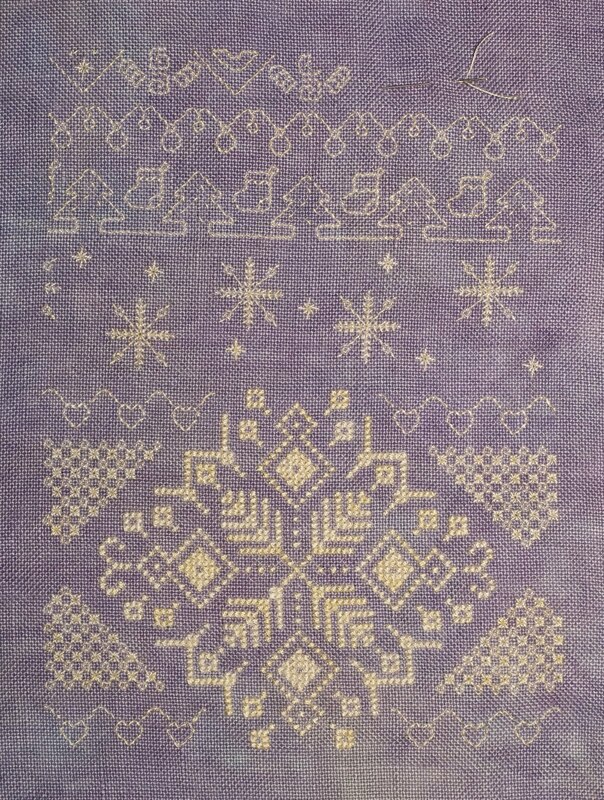 I completed the diamonds in the middle and their Jessica stitches this week. There's a bit more to do in this middle area, but it's already standing out pretty well. When I arrived, we went to the restaurant across the street. 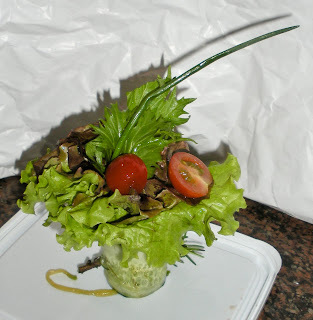 It's a French restaurant, rather pricy, and the food is art. 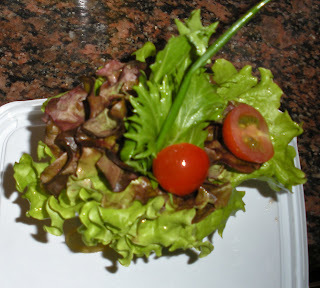 I brought home the salad and we took these pictures the next day. I couldn't believe how much effort it took to make this. 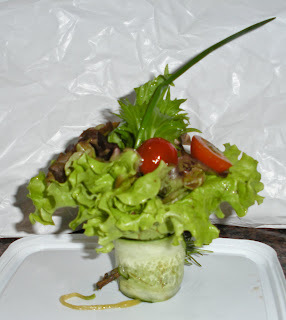 The bottom is wrapped with a very thin slice of cucumber speared with a stalk of rosemary to keep everything in place. This week was Jessica week. 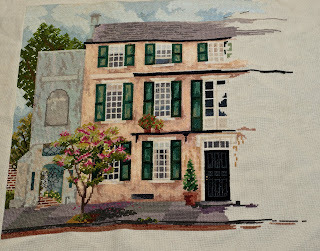 I did four of them on the central house and several large Rhodes stitches on other windows in the same color. Not much done outside of that, but it was a lot of work. The big door's done. I also did some more on windows. Now on to more windows and sky. These are pictures from Saturday morning. 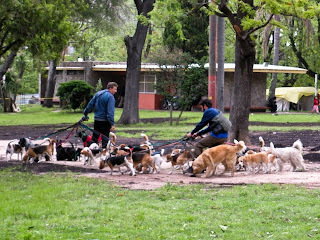 We got to the park with the market in it at the time the dog walkers were plying their trade. 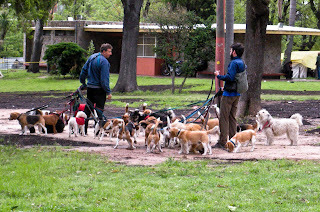 It looked like beagle-mania. I don't know how they get all the beagles back to the right owners. Can you imagine trying to wrangle all those dogs at the same time? Nearly everyone in Uruguay has a dog and the people here are the most dog friendly I've seen. 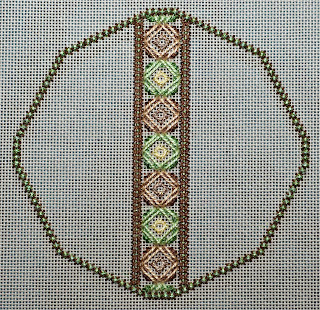 Beginning to stitch a bit more despite a procession of maintenance people in and out of the house, I've completed part three of Tam's Christmas Mystery. It's getting there. Now onto See the Stars part ten. Working on my travel piece this week, I got the ribbon floss laid and the beads in place. She calls for the beads at this point, so I'm putting them in in the fear that I'll have to be careful about working around them. 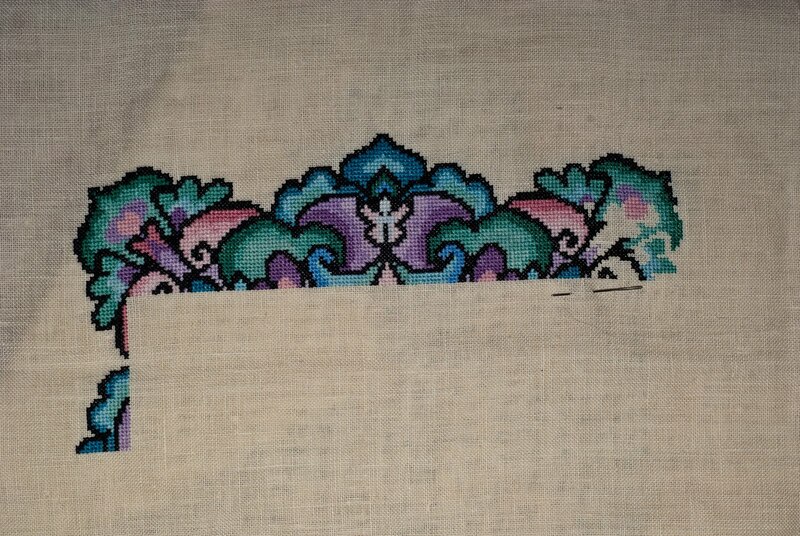 I'm on the second row now of the first rectangle, so you can pretty much make out the pattern of it now. This picture doesn't quite capture the color well, though. On the second line, I'm wandering across rather nicely. It's much more complicated than the top line was. 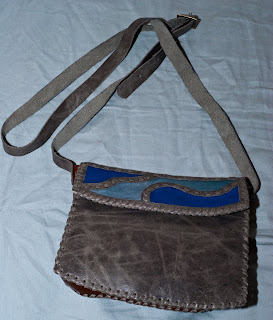 We went to the local market on Saturday despite the threat of rain and there was a stall selling handmade handbags. I bought this one for all of $12.50 US (250 Uruguayan pesos). Not bad. I really like the feel of the leather, and love the color. 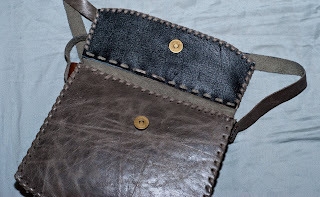 Here's a picture of it closed with the nice detail on the flap. At this price, I might be able to indulge in a few more.